This has got to be the simplest soup I ever made! Mostly I wanted some stuff out of my freezer to make a little room! The stock, beans, zucchini, tomatoes and celery root all came right out of the freezer and into the pot. As usual, my recipes are vague – make it your own! 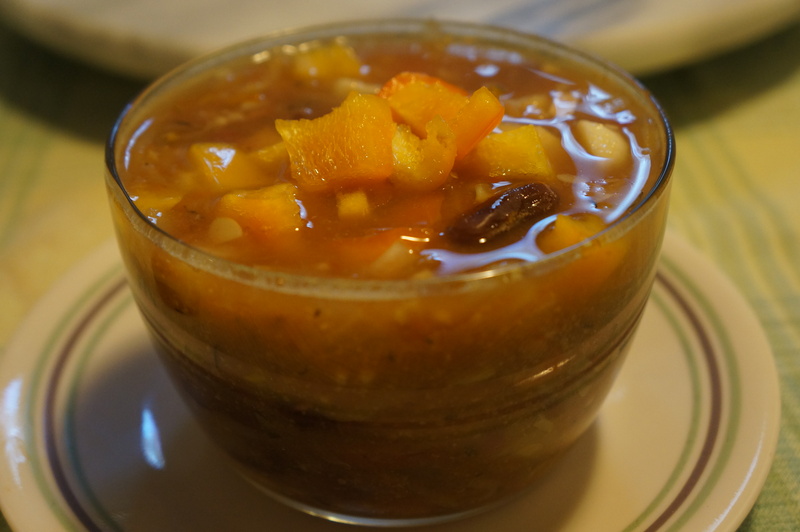 This is my new normal – make soup on Monday – enjoy 2 days off of cooking dinner! It really hits the spot, too, with the weather turning cooler. If you don’t have the above seasonings just use plain old chili powder as a substitute. Also, try hunting around in your spice cabinet and adding some others like Thyme, Oregano, Marjoram, Old Bay Seasoning – all would be great additions. 1. Melt butter in soup pot over medium heat. Add onion and cook until onion starts to smell good and create brown stuff on the bottom of the pan. Scrape up brown stuff – that’s the flavor! 2. Add other veggies and beans except tomatoes. Use a variety of what you have. Can be fresh or frozen. 3. Add seasonings and then stock and water. Get it all steaming hot and then add tomatoes for just a few minutes after which you can slip the skins right off of them to compost. 4. Right before serving stir in the peanut butter. Then top each bowl with peppers and garlic. (Other toppers work great too – chopped herbs like parsley/basil, chopped avocado, grated carrot or beet, use your imagination!) Yum! Try to make it, Tim, you’d like it! I’m snowed under with work at the moment. My wife is also disabled and my mother isn’t very well. Oh, I’m sorry to hear that, Tim. Hey Celeste! I’ve done the Monday soup thing for 3 weeks now, I think, and it’s so great to not have to worry about dinner for a couple nights. You are welcome to copy the idea! And also, did you notice the vegan variations I included? I was thinking of you and your friends when I did that!